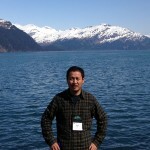 Professor Shuo Ma has been invited to lecture at the International School on Earthquake Science held September 23-27, 2013 in Hakone, Japan. He will be amongst an elite group of 15 earthquake scientists from around the world invited to speak at conference organized by The Earthquake Research Institute of the University of Tokyo and the Southern California Earthquake Center. Shuo will be presenting a lecture on “Uncovering the Mysteries of Tsunami Generation and Anomalous Seismic Radiation in the Shallow Subduction Zone”. Ma’s recent work with colleagues modeling gigantic tsunami-generating earthquakes has drawn international attention by addressing long-standing mysteries of tsunami generation that help to explain the extra punch delivered by the March 11, 2011 Tohoku earthquake-tsunami that led to the Fukushima Daiichi nuclear disaster. Ma, S. (2012), A self-consistent mechanism for slow dynamic deformation and tsunami generation for earthquakes in the shallow subduction zone, Geophys. Res. Lett., DOI: 10.1029/2012GL051854. 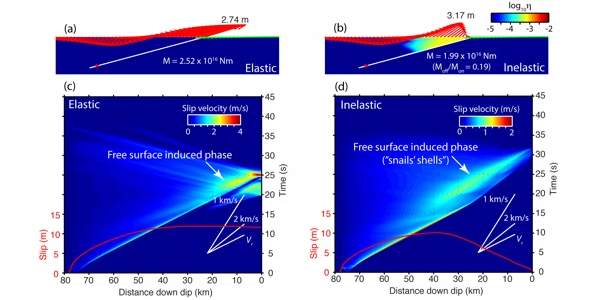 Comparison of seafloor displacements, rupture veolocties, and slip distrobutions between an elastic and inelastic simulations of earthquake rupture on a shallow subduction megathrust. The extensive failure In the overriding wedge seen in the inelastic simulation likely solves nearly all loog-lasting puzzles associated with tsunami qeneration.